During the Spring Semester of 2007, this fool rushed into Second Life, something he felt would not only change education but the world beyond. Virtual worlds looked like a utopian technology with lots of zealous folks ready to evangelize the masses. Six years later, grading what may be my last-ever student projects about virtual worlds and somewhat wiser, this educated fool wonders why SL did not change the world or even higher ed. I've written elsewhere about why SL failed to become that "3D Web" of yore. Meanwhile, the bandwagon has moved on, the cheerleaders yelling "hurrah! "and "higher education will never be the same!" for MOOCs. I'll sum up what I've learned about utopian narratives and would-be transformative technologies here, based on not only the last 6 but the last 25 years of studying and writing professionally about technological change, especially that which generates legions of enthusiasts. I first head about Second Life in a story from Wired. That is not a sedate or juried publication; it's the Popular Mechanics of the digital era. Ever the sucker for flying cars and moon bases, I decided "I need to get in early with this technology," not considering that one company, with a closed platform not built for education, held the cards. I trusted the vision of Magic Koolaid provider, Philip Rosedale. Linden Lab's corporate culture and Rosedale's wandering vision both disappointed this educator, along with many colleagues. Who is pushing MOOCs today? College faculty members? Technologists who embrace the new without considering pedagogy of large classes with little or no contact with faculty? Right-wing lawmakers eager to dilute the power of those "tenured radicals" supposedly in charge of Higher Ed? Boards of Visitors eager to promote a school "brand" without a clear sense of what it will do to curriculum, staffing, or the long-term value of that "brand"? Ask yourself, and take a deep breath before jumping on the band wagon. I do wish I'd looked past the euphoria about virtual worlds in 2007 to see who was cheering most loudly. I was not in virtual worlds for the money. As noted just now, I wanted to be in on "the next Web," as many were then pitching SL. In 1993, when I first saw a moving weather-pattern on the Mosaic browser in Dickie and Cindy Selfe's lab at Michigan Tech, I knew I was seeing something historic. In 2007 I thought so again, without applying the very critical-thinking skills I teach my students. From 2003-06 or so, it made sense for venture capitalists to take a bet on this new technology. It might have become the next Web. Educators, however, need to always place sound pedagogy ahead of tech, which is a suspicious I have about the euphoria over MOOCs at the moment. I saw that same brand of enthusiasm for MOOs in the late 80s and early 90s, literary hypertext a bit later, glove-and-goggle VR from the 80s to the present, and of course, virtual worlds. While one might reasonably claim that virtual worlds are going to become significant culturally, I'd suspect lots of Magic-Koolaid drinking by an educator who claimed SL will ever again be more than a niche-product in years to come. 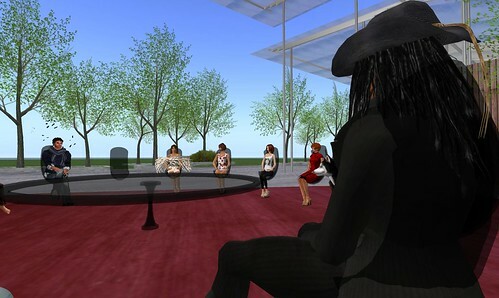 AJ Kelton of VWER rightly called SL "The AOL of virtual worlds" to the disdain of several Linden Lab staff. AJ was correct, and the Lab staff in question now work elsewhere, after being fired during the first stages of Second Life's ongoing and palpable decline. Bottom line for me: waiting to see if SL lived up to its hype would have cost me nothing in 2007, and would have saved me time. Had I first taken a class in-world in 2009, I'd have been ready for the myriad frustrations and technical issues that bedeviled a product that seemed very much in Beta up to that point. During the summer I spent with the Selfes and their grad students at Michigan Tech, Richard "Dickie" Selfe, co-founder of that school's CCLI humanities lab, along with wife and fellow scholar Cynthia Selfe, once told me only to adopt trailing-edge tech for teaching and learning. The Selfes were among a group of 1980s pioneers with personal computing in the classroom, and Dickie's lab at MTU was a playful space, with stuffed animals, a coffee machine, snacks, and weekend gaming sessions with Doom and similar titles. I'm sure that at Ohio State they continue this practice, so influential to young scholars of writing pedagogy in writing-intensive curricula. At every step, while the Selfes liberally experimented with leading-and-bleeding-edge applications, in the classroom they proceeded more carefully with undergraduates. The older technologies were stable, easier to support, and grounded in best practices for teaching. My experiences in 2007-8 in SL, and then in 2011 with OpenSim's Jokaydia Grid, taught me the dangers of being on the bleeding edge. My students and I bled. Only Jokay's personal help saved the final exam in 2011, but it left a bitter taste in my mouth for teaching with OpenSim. As for SL, only by 2009 was it stable enough for a class to appreciate. That class was, ironically, my last one to focus on the technology, rather than using it for a single project. Today, SL as a product is fairly stable, and critical and scholarly work about virtual worlds has emerged to guide our pedagogy. One would be far better off starting today as a SLer with students, given these two changes. Those on the bleeding edge, however, get cut by it. My years with the Virtual Worlds Education Roundtable have been good ones, and I cherish the faculty contacts I have made there. That said, the weekly meetings and constant advice did not compensate for a lack of interest in virtual worlds on my campus. With other innovations, from our Writing Consultants program to First-Year Seminars, we meet in person and I have lunch with folks in the flesh. There is no substitute. Our technologists all had avatars before I did, but they never convinced more than a handful of faculty to try SL. The learning curve, the oddness of avatar-based education on a residential campus, and the lack of incentives for faculty all worked against us. In the end, SL was an experiment that failed at Richmond. When Linden Lab renewed the 50% discount for education (if you ask the right person!) we declined. Why spend even $150 monthly for a product that might be used once every few years by one faculty member? Meanwhile, our technologists have other more tasks, from supporting Blackboard and other meat-and-drink software to new initiatives with mobile apps. Mobile may turn out to be the "new shiny object" for education, but it's not a niche application for students. As for MOOCs? I will wait to see comparative studies of students' learning outcomes in them and outside them. That should have been done for virtual worlds. The transition to smart phones as students' primary communications tools has changed everything for us. While laptops abound, students use them like big phones: never plugging in the AC adapters, perching them in nooks where Millennnials gather to collaborate, plastering them with stickers to personalize them. I suspect that with a better keyboard, students would do their content creation on fast tablets, since we have ubiquitous and fast wireless everywhere on campus. None of that I could have foreseen in 2007, since I did not even slow down enough to consider how poorly SL would run on many laptops, especially those not hard-wired to an Ethernet port or plugged into a AC outlet. Even with desktop connections, students loathe SL's lag. I saw that last week in the finals. Perhaps server-side baking from Linden Lab will make SL run better on what my students still use for content creation--laptops--though not on phones, where virtual worlds simply cannot display with any sort of grandeur. But by then, Iggy will have left the virtual building. I'm thankful for an experiment of six years, even if the experiment failed. At least virtual worlds generated two publications for me, as well as a forthcoming anthology I'm co-editing with some chapters about virtual worlds. I don't write the rules, but publications and teaching evaluations are the currency of academia, despite the best wishes of utopians that it be otherwise. It is always possible that my teaching load will shift again, and my Chair and Department will call on me to teach my course about the history, culture, and future of Cyberspace. In such an event, Iggy and his students will be back. Look out. As sorry as I am to see you follow me out of teaching in virtual worlds, because you did so much more with it on the teaching front than I ever did, I'm glad we'll remain in contact. Second Life may have its flaws, and lord knows it does, but one of the best things to come of my/our time here has been the friendships that were formed. God bless, Joe, and Godspeed, Iggy. Put my name down to purchase one of the first, SIGNED copies of your forthcoming book on the subject. P.S. You have to love walking around being covered in blood. It's a great feeling sometimes. Frankly, I love being on the cutting edge in eduction. I guess it is because I thrive on delayed gratification. I remember my first presentation before a group of teachers. It was 1982 and I was literally booed off the stage. How dare I suggest that words should ever be "processed!" Words should be respected and revered. Little did I know that the head of the English Department of the school I had just accepted employment was in the audience. After seeing me in our first faculty meeting, she convinced the Faculty Council to pass a rule that no paper that had been word processed would be accepted in any class. You cannot imagine my joy in 1985 when she thanked me for placing a laserwriter printer in the English Department office. Of course, she denied ever being against such a wonderful educational tool. How about embracing the Technology Agnostic Approach? The U.S. Army Learning Concept 2015 (PDF) does not focus on any particular TECHNOLOGY, but rather focuses on the OPPORTUNITIES presented by dynamic virtual environments, by on-line gaming, and by mobile learning. It speaks of access to applications, the blending of physical and virtual collaborative environments, and learning outcomes. Embracing Quality Management would have saved you many illusions. Goodbye, Iggy, change is. I can envision the day Scottmerrick Oh will be moving on, but I'm not there yet. Still too much happening in virtual worlds for me to discount them, and I consider it a still-fascinating "hobby" with potential. I've had my share of failures, but as AJ said, the human people I've met and bonded with in connection with virtual worlds, that's the shizz. thank you for sharing your insight and your experiences - i think you are spot on and no one can fault you for not trying! @Scott, I agree with the hobby potential. I do a bit of RP as a pirate, and he'll be in-world. Iggy will, too, as a participant if not moderator at VWER.